Students in grades K-2 have been learning about dynamic (moving) and static (still) balance in P.E. Dynamic balance involves the ability to keep the body balanced with and without the use of equipment to help. Students used bean bags balanced on their arms, heads, and shoulders as they moved around the gym. 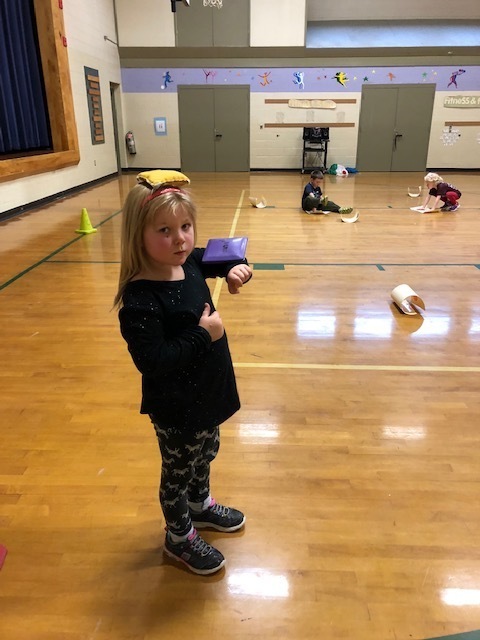 They walked around and over obstacles such as cones and small plastic discs to practice keeping an object balanced on their body without having it fall off. Students used the balance beam to practice standard dynamic balance. Static balance involves keeping the body still without losing one's balance. Students copied poses from a variety of pictures as they balanced on various body parts, such as two hands and one leg, two elbows and one knee, and balancing on just one leg. P.E. is a "balancing act" of learning all different ways of moving, staying fit, and sometimes, learning to just be still.